kelp-clothes thrown at the land. and all of us are closer to the beach –"
The menace in ‘crawling’ ‘graven’ and ‘closer’ is echoed in the long vowels of ‘seep’ and ‘deep’ purposefully underlining the real danger of coastal erosion. 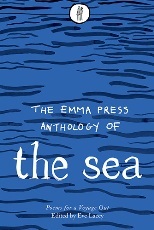 Most of the poems in The Emma Press Anthology of the Sea feel timeless but not old fashioned. Those using traditional forms avoid archaisms and still seem contemporary and relevant. There are no bloated carcasses and no sense of being cast adrift in a rudderless dinghy with tired scenery and the tedious tang of stale salt. Despite the familiarity of the theme, these poems are fresh and alive in imagery and craft. Each poem is like a boat that invites the reader to trust the machinery and take in as much or as little of the view as they desire.